Introduction by James Martin, associate editor of America. How many debates about the liturgy have you sat through in your parish? Few discussions animate American Catholics more than those over such topics as the use of inclusivelanguage, the selection of hymns sung or music played at Mass, the quality (and length) of the homily, whether to kneel at the consecration, the “proper” use of eucharistic ministers, how closely the presider follows the prescribed rubrics, the degree of “reverence” of the congregation, and the behavior of children during Mass. When carried on in a community with a great deal of trust, such discussions lead to improvements in parish life and a deepening of appreciation for the Mass. Just as often, however, they can devolve into what are sometimes called liturgy wars, leading to frustration and even anger. Sadly, such controversies distract Catholics from what they care most about in their parishes—the Eucharist, the liturgical celebration the Second Vatican Council described as “the true center of the whole Christian life for the universal church and the local congregation” (“Constitution on the Sacred Liturgy,” No. 6). 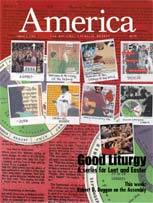 In an attempt to refresh our readers on the subject of the liturgy, during the Lent-Easter season this year America offers a multipart series entitled “Good Liturgy.” For the next 10 weeks some of the country’s leading scholars, experts and practitioners will consider the liturgy from the vantage point of the various roles taken by participants in the Mass, examining how each contributes to good liturgical celebration in the Catholic Church today. Our series begins with the role of the assembly, followed by essays on presiders, deacons, lectors, eucharistic ministers, music ministers, parish liturgical councils and ministers of hospitality. At the close of the series, Nathan Mitchell, associate director of the Center for Pastoral Liturgy at Notre Dame, will review the essays and offer a summation. Each essayist has been asked to look at the spirituality and theology underlying a particular ministry, as well as its history, current questions regarding its place in the liturgy, helpful practices and also some practical examples from personal experience. Still, more and more among the laity are beginning to make connections between their dignity as baptized persons and their responsibility to participate actively in the Eucharist. The ongoing work of liturgical renewal has made many inroads, developing an awareness of the importance of the assembly’s role at worship and teaching a variety of practical skills that enable fuller participation. Nonetheless, old habits die hard, and practices still taken for granted in many parishes militate against real ownership of the liturgical action by the assembly at large. For nearly two decades, I have been blessed to minister as pastor in a parish community that takes seriously its responsibility for eucharistic celebrations that are vibrant and faith-filled. Without wishing to suggest that we have “arrived” or are a “model” parish (we haven’t and we’re not), I have nonetheless experienced firsthand some of what it takes to restore to the assembly its sense of ownership of the liturgical action. Realizing that others may wish to add to my list, I offer my own formula for success for helping the assembly achieve that “full, conscious and active participation” at the Sunday Eucharist of which the official documents speak. Proclaim and preach the Scriptures in a manner that engages at a deep level the attention (and faith) of the assembly. There is no more profound experience of communal participation in the liturgy than the utter stillness that overtakes a community that has just heard the word of God proclaimed (or preached) with a power that takes the breath away. Lectors and homilists carry a heavy burden if they are to reach that degree of effectiveness on a regular basis. But members of the faithful also share responsibility for becoming more scripturally literate and for demanding a higher-quality experience from those who minister the word to them on Sunday morning. The choreography of the eucharistic prayer needs to be reworked to engage the assembly more actively in its proclamation. This will require more refined skills by presiders who proclaim the text, a more interactive structure (like the sung acclamations that punctuate the children’s eucharistic prayers), a more coherent “body language” that allows for a single posture (preferably standing along with the presider) from start to finish and, most critically—on the part of the faithful—a more highly developed interior awareness of offering themselves, along with the presider, in the great sacrifice of thanksgiving and praise that is the eucharistic prayer. Larger issues of ecclesiology and Christian identity also have to be addressed as the backdrop against which full and active participation makes sense. The people of God require alived experiencethat “we are the church.” In order for this to happen, many other aspects of church governance and polity will have to be considerably different from their present experience. In addition, membership and belonging must be defined in terms of a faith that is deliberately chosen and consciously lived (as it is presently, for example, in the adult initiation process). This kind of faith must characterize the assembly at large. Morever, conversion to discipleship—not mere cultural Catholicism—must be the normative understanding of our Christian identity. It would be wonderful if the hierarchy were to take the lead in this regard, but the parish is where people live their lives. Nothing prevents local communities from offering their members right now a practical “ecclesiology of belonging” to meet these needs. Implement regularly the full range of ritual options that currently invite the assembly’s active participation, and keep an eye open to others that might yet be developed. A good example of this is the adult initiation model, which regularly insists on the ritual involvement of the entire community in the “work” of making new Christians. This requires of the assembly a willingness to be “stretched” in its ritual repertoire of gestures, processions and other elements that call for the engagement of our bodies as well as our minds and hearts. Ordinary Catholics need to know in their bones that their full participation in the ritual action is crucial for its success. You will know this is working when more people arrive on time and fewer leave early. Promote as the context for the community’s participation in the Eucharist a gathering that is warm and friendly, welcoming of diversity and hospitable to the stranger. We can no longer tolerate the perception that parishes where the worship is more relaxed and friendly are “Protestant” in style. The call to be evangelizing communities requires that the “frozen chosen” thaw out and show in real, human terms—above all when they gather for worship—the irrepressible joy that befits a community claiming to know in a personal way the saving grace of Jesus Christ. The isolationism seen in the privatized, individualistic way so many Catholics still worship must give way to a more highly developed awareness that the eucharistic liturgy is public and communal by nature, the “work” of the entire people of God united in a single prayer of praise and thanksgiving. Continue to teach, reflect on and preach about the enormous importance of baptism and its intimate connection with the offering of the eucharistic sacrifice. Catholics need to have a strongly developed liturgical spirituality that makes them more aware that at the Eucharist they join with the presider in the offering that Christ, the one and only high priest, makes to his Father for the life of the world. The royal priesthood of baptism consecrates the assembly of believers to a life of worship that finds its “source and summit” in the eucharistic gathering, and the faithful deserve to know about the solid theology that supports this perspective. Catholics everywhere need to recognize that the assembly’s full participation in the Eucharist requires as a normative practice communion under both kinds from elements consecrated at that liturgy. Denying the cup to the entire assembly and serving “leftovers” consecrated at a previous celebration are vestiges of a pre-Vatican II practice and strike at the heart of the assembly’s full participation in the Eucharist. The faithful who still do not value the importance of partaking of both breadandwine consecrated atthis particularsacred meal need to be helped to gain that appreciation. The complicitous silence of the faithful as their bishops solve the priest shortage with “Sunday Communion Services in the Absence of a Priest” is symptomatic of a failure to claim their right to the celebration of the Sunday Eucharist as baptized members of the body of Christ. That such a solution is spreading so quickly (and with so little protest) indicates how much work remains to be done among the people of God in order to reclaim the vision described so glowingly by Pope John Paul II in his apostolic letter On Keeping the Lord’s Day Holy (Dies Domini). Personal experience has taught me not only that these steps are important, but that they are achievable. The council fathers’ call for a renewed liturgy—celebrated by assemblies that participate fully, consciously and actively in the Sunday Eucharist—is not the idle fantasy of starry-eyed idealists. Rather, it is the inspired vision of Spirit-led leaders, who dared to dream of a renewed church, gathered around the table of the Lord, singing God’s praise with all the gusto of true believers. If history is ultimately to judge the Spirit-led aggiornamento called for by Pope John XXIII a success, it will in no small measure be the result of the people of God awakening to the privileges and responsibilities that are theirs by virtue of baptism. Nowhere is this more obvious than in the Second Vatican Council’s renewal of the sacred liturgy, now a work 40 years in progress and truly just beginning in earnest. The hierarchical church has done its work reasonably well—despite some signs of retrenchment in recent years—by publishing an entire corpus of revised liturgical books, enacting enough rubrics and liturgical laws to fill a small library and overseeing the process of translation and inculturation with watchful, if somewhat timorous, eyes. What remains to be accomplished is mostly at the local level, where the people of God gather on Sunday mornings to face the challenge of breathing life into the liturgy, turning “correct” liturgical forms into true celebrations of faith. Much has been said since the council about what must be done to renew the various ministries that collaborate in the Eucharist. But the foundation for all ecclesial renewal, and for a renewed liturgical experience in particular, rests with a faith-filled, well-informed and committed assembly of the faithful who do their job with the “full, conscious and active participation” (“Constitution on the Sacred Liturgy,” No. 14) that is rightly theirs by virtue of their baptismal consecration as a royal priesthood. Official documents are not lacking since Vatican II that emphasize the importance of the ministry of the liturgical assembly. The “General Instruction of the Roman Missal” says that at Mass the people of God “offer the spotless Victim not only through the hands of the priest but also together with him...” (G.I.R.M., No. 95). Another recent document from the Vatican entitled Directory on Popular Piety and the Liturgy (2002) minces no words in describing how historical factors during the Middle Ages and afterwards resulted in a passive, nonparticipatory role for the faithful at Mass, a problem we are still working to overcome. The directory points out that one of the causes of this lamentable development was “a weakening of a sense of the universal priesthood in virtue of which the faithful offer ‘spiritual sacrifices pleasing to God, through Jesus Christ’ (1 Pt 2:5; Rm 12:1), and, according to their condition, participate fully in the church’s worship” (No. 48). Today, the impact of these official documents needs to become part of the awareness of the assembly at large. It is they—just as much as the presider—who must offer the great sacrifice of praise and thanksgiving to God; it is they—just as much as the presider—who carry responsibility to say the prayers and sing the songs prescribed for them in the ritual texts; it is they—just as much as the presider—who must be channels of the Spirit’s consecratory power, allowing the gift of themselves to be transformed as surely as the gifts of bread and wine are changed into Christ’s body and blood. When it comes to reflecting on the Liturgy, the majority of American Catholics tend to focus more on ‘wants’ than ‘needs.’ We want good parking spaces, music, homilies, lectors, deacons, doughnuts. and preachers. While I am encouraged by the quality of questions that are being asked of each essayist--especially in the areas of spirituality--I am a little concerned that the choice of essayists is too narrow and will ultimately soften this series. Each essay has one thing in common—they all focus on internal, liturgical issues. The true genius of the Second Vatican Council was, in my estimation, not liturgical reform, but rather the powerful articulation of the dynamic and transforming role that the laity can play in evangelizing the modern world. We lay people who try to live out our faiths during the week pick up America magazine each week with the sincere hope that our lived experience outside the Church can somehow mysteriously connect with the sacred words of the Eucharistic Prayer. I look forward to seeing how your series can provide us with such critical tools. Father Duggan's article is excellent and most worthwhile; the entire series promises to be most worthwhile! As an architect who is familiar with the principal liturgy documents as a matter of faith and as a means of discharging my professional responsibilities when executing church designs, I am disappointed that neither the introduction nor the article noted the basic and essential concept of the assembly as one of the four presences of Christ in the liturgy of the Mass. In my experience, this concept is unknown to almost all of the laity, many - if not most - of the clergy, and can be anathema to most of the "frozen chosen." I think your series will benefit by some sort of brief overview of the liturgical principles; the individual articles can then be read and understood as detailed development of those principles. The “Good Liturgy” article on the assembly (3/1) reminded me that years ago my parish priest said to me, “Can you, as a reasonably intelligent Catholic layman, tell me why the people don’t sing at Mass?” I could not wait to reply. First, I am a lousy singer and as such I don’t enjoy it. (Once in parochial grammar school, the music Sister visiting our classroom asked me not to sing, obviously in order to improve the quality of the class performance.) Second, I have always felt the hymnal should be renamed “Mostly Songs Nobody Ever Heard Of.” There seems to be a desire to introduce songs with which the congregation is not familiar. Third, we are often advised after Communion to kneel and meditate—and also to sing hymn number whatever. I cannot do both, and I prefer the former. With regard to receiving Communion under both species, I cite another experience from parochial school days. I was asked by the Sister if the body and blood were present in both the host and the consecrated wine. I said no, and she promptly and loudly accused me of heresy: the body and blood are present in both the host and the consecrated wine. So what’s the big deal about receiving under both forms? For old coots like me, and not a few young coots, there ought to be a way to attend Mass quietly, thoughtfully and not have to worry about remembering the name of the person in front of me with whom I am about to shake hands. Over 40 years of reading America have only deepened my esteem for your ministry to all of God’s people. Your articles continue to get better and better. Your series “Good Liturgy” (3/1) seems to cover every aspect of liturgical practice and easily speaks to all of us, no matter the liturgical role. I plan to share each topic with our parish liturgy committee over the next planning year. Thank you for enriching us with food for prayer, reflection, sharing and formation. I do not seem to understand the full scope of the proposal here. The Second Vatican Council and the Constitution on the Sacred Liturgy also mentions as a form of participation a better Cathechis for lay people in the use of Latin and how it pertains to "parts fo Mass that pertain to them". It is to be retained in the liturgy even with more use of the vernacular. The is no mention of this in your post and how it pertains to the faithful. It IS part of the Constitution and what the Council Fathers insisted upon.I for one would like to recite the Lord's Prayer with people of different languages and cultures all together in Latin. Why must I be segregated from people with different language backrounds in different Masses..Spanish to Spanish Mass, English to English Mass, Vietnamese to Vietnamese Mass. Wasn't it the intention to have us all together learning from each other's cultures and striking up friendships, and yet having a common denominator which unites us in Prayer? Why in most parishes can you not find a Latin Mass in the schedule that draws people of all backrounds together? The arguement that we can not learn a few Prayers over the course of our lifetimes in Latin just doesn't hold water in today's world of internet and numerous resources. Besides the other dominant world religions have this option or it is mandatory. I mean if we are going to focus on what the Constitution on the Sacred Liturgy asks then let's do so fully. The article just seems to pull out certain parts to get across an agenda that is exclusive rather than inclusive. And if we as lay people do not have enough Latin backrounds whose fault is that? It was the Church and local Bishops who did away with it against the directives of the Council, later school disticts were to drop it. I mean why take Latin if you can not even use it on Sunday in the Roman Catholic Mass? This article also appeared in print, under the headline "Good Liturgy: The Assembly," in the March 1, 2004 issue. Rev. Robert D. Duggan is pastor of St. Rose of Lima parish in Gaithersburg, Md., and a columnist for Church magazine.